Although we will celebrate the centennial of the opening of Huntington Hospital in 2016, it could be said that the first hospital in town dates to 1771 when Huntingtonians were in a panic about inoculations against small pox. Unlike the vaccine developed by Dr. Jenner in 1796, which used cowpox to build immunity from smallpox, inoculations involved exposure to smallpox itself and were not always administered by a doctor, often with fatal results. In 1771, Huntingtonians imposed stringent restrictions on inoculations. Only Dr. Potter and Dr. Wiggins were allowed to administer inoculations; and they could only do so at a house set aside for that purpose. Dr. Potter’s house was in Cold Spring Harbor. Dr. Wiggin’s house was on the east side of Park Avenue south of the Town Common. A few decades later, in 1855, the property that Dr. Wiggin’s used for his smallpox “hospital” was purchased by Rufus Prime. Mr. Prime was a retired New York City merchant and banker, whose children, Temple and Cornelia, became the most generous philanthropists of early twentieth century Huntington. Their donations helped finance the building of the Soldiers & Sailors Memorial Building, which housed the first library in town; Huntington’s first Town Hall; St. John’s Church on Main Street; Grace Chapel in Huntington Station; and the Trade School building (currently being restored and expanded to hold the Historical Society’s archives). After several false starts, the effort was begun in earnest in 1911 with a meeting held at the Trade School building. It was noted, “Similar moves have been made in the past, with no results, and representative business men are inclined to doubt the practicability of a hospital here.” Mrs. Roland Conklin of Rosemary Farm (now the site of the Seminary of the Immaculate Conception in Lloyd Harbor) was selected as chair of the committee appointed by the Huntington Association (a forerunner of the Chamber of Commerce) to explore the idea. The initial fund raising event was also the biggest society event of the summer 1911 season. Mrs. Conklin and her committee of 16 other prominent women arranged a performance of Shakespeare’s “As You Like It” at the outdoor amphitheater at Rosemary Farm on August 19. More than 1,500 people, including former president Theodore Roosevelt, William K. Vanderbilt, Jr., Secretary of War Henry Stimson, and New York Mayor William J. Gaynor attended the well-received performance. Three days later, at another meeting held at the Trade School, the committee reported that the play at Rosemary Farm netted $2,000. Willard Baylis estimated the cost to purchase land and construct a new hospital building would be $15,000. Mr. Baylis also made a motion to appoint a committee of 25 citizens, including the women who had previously been appointed by the Huntington Association, to solicit funds for the project. The eight new members of the committee were men. It was thought that constructing a new building was preferable to refitting an existing building and that the hospital should be located on high ground, near the village and the railroad station. Soon the residents of Northport expressed support for the plan to build a new hospital. They argued it should be located near the train station so that it would be accessible for patients from communities to the east and would be convenient for doctors from those communities to get to the hospital to visit their patients. Father York, pastor of St Patrick’s Church offered the use of the St. Patrick’s Parish House on Main Street for a hospital. While the 17 women on the committee—only one of whom was Catholic—were inclined to accept the offer, opposition arose because it was felt that using the Catholic Parish House would render the hospital sectarian in nature. Fr. York relented and agreed that purchasing a new site would be preferable. He added that if the committee could not secure sufficient funding for a new site, his offer would stand for five years. Mrs. Winkworth’s hospital was a private endeavor; the weekly cost ranged from $20 for a private room to $12.50 for a bed in the ward. Doctor’s fees and drugs were extra. Even though it was a private venture, Mrs. Winkworth did not turn patients away. She treated the indigent as well as paying customers. The Town would reimburse the hospital for caring for the poor. But the sum provided was not as much as the expense incurred by the hospital. Mrs. Winkworth made up the difference out of her own funds. In its first six months of operation, the small cottage hospital treated 98 patients, many of whom were accident victims. The Long-Islander newspaper was soon suggesting that the fund raising for a hospital be resumed and that the new hospital be put in the care of Mrs. Winkworth. Or the funds already on hand could be used to purchase the house that Mrs. Winkworth was renting for her cottage hospital. Perhaps spurred on by the success of the Winkworth Hospital, the task of raising funds for a new hospital were renewed in the fall of 1914. Looking back years later, the Rev Charles E. Cragg, who led the dedication of the Winkworth Hospital, noted that though it was a valiant effort, Mrs. Winkworth’s hospital was inadequate to the task. 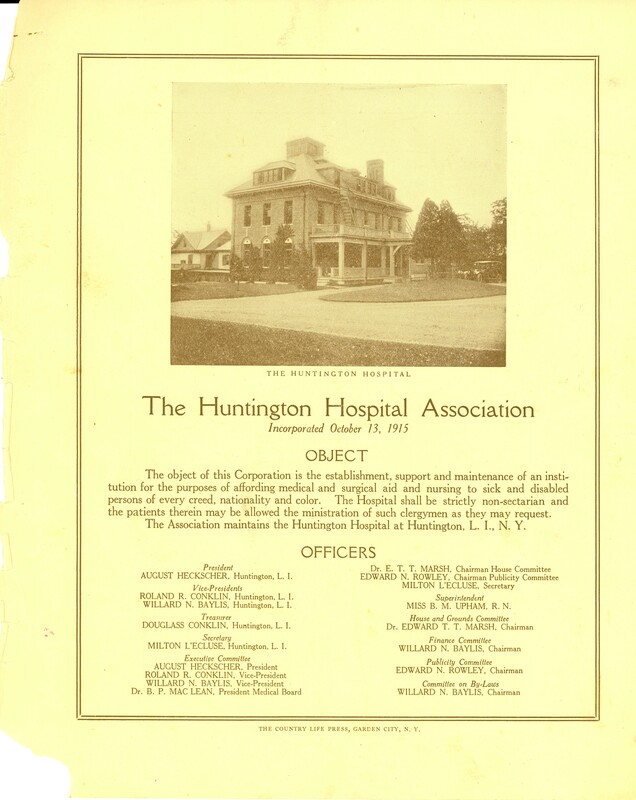 However, “the attempt showed the great need of a real up-to-date and well-equipped hospital in our town, and moved to action the actual founder and builder” of today’s Huntington Hospital. In September 1914, John Fleet Wood led the effort to resurrect the fund raising campaign for a public hospital. Citing the large number of accidents in town, the plan was to build an emergency hospital at first and later expand it to include all cases. The most contentious issue became where to locate the new hospital. More than half a dozen sites were under consideration. Dr. Gibson favored a site on Cold Spring Hill. Other doctors objected, noting that the site was up a steep hill and that the roads in the vicinity were in poor condition. Another potential location was the Alonzo Buffett property on the east side of Woodhull Road near Nassau Road. This property had the advantage of being near the railroad, but not too far from the village. The disadvantage was that it was near the noisy Liederkranz Hall. Sentiment seemed to shift in favor of the Buffett property in Huntington Station, especially when the residents of Cold Spring Hill voiced their opposition to a hospital in their neighborhood. The issue was finally settled by Cornelia Prime, who had been on the fund raising committee since 1911. Miss Prime decided where the hospital would be when she purchased a five-acre site on Park Avenue in December 1914: “the donor saw the Scudder property, which appealed to her, purchased it and then announced that it was the hospital site.” The property had been one of 7 or 8 sites considered by the hospital committee. The property featured a two story concrete house with six rooms and a bath as well as a garage, barn and workshop. Miss Prime paid $17,000 for the property and committed another $3,000 to convert the house for hospital use. However, it was soon decided that a new building should be erected. By the next summer, the new 32’ x 70’ brick and limestone building was under construction. The concrete house on the property would be used as administrative offices. Miss Prime had agreed to underwrite the cost of construction. The total gift, including the land purchase and construction of the new buildings, amounted to $75,000, the equivalent of $1.77 million today. The house on the property and the new brick hospital building. Miss Prime’s gift to Huntington was completed in time for Christmas 1915. 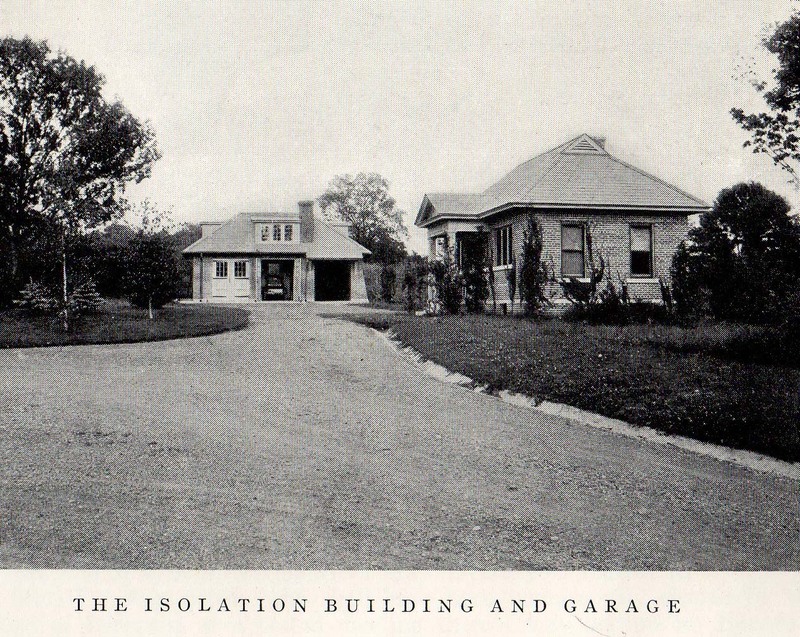 In addition to the new two-story brick building, which was connected to the old house by a large passageway, the hospital campus included an isolation building for the treatment of contagious diseases and a garage big enough to accommodate two cars and a horse. Dr. Edward T.T. Marsh, head of the building committee, was instrumental in the construction of the building. Dr. Marsh was a native of New York City, who had served during the Civil War as a naval surgeon. He set up a medical practice in New York City and in 1870 married Alice Crossman of Huntington. He served as surgeon for the New York City Police Department and the 71st Regiment of the New York Militia until his retirement when he moved to the George Washington Scudder House at the intersection of Park Avenue and New York Avenue. He is credited with convincing Miss Prime to donate the funds for the hospital. In his obituary, it was noted, “The Huntington Hospital owes much, both to their generous gifts and also to the careful supervision of Dr. Marsh during the erection and for some years after it opened.” In addition to his medical works, Dr. Marsh was known as the King of Baseball in Huntington. He rescued the local team and served as its manager for many years. 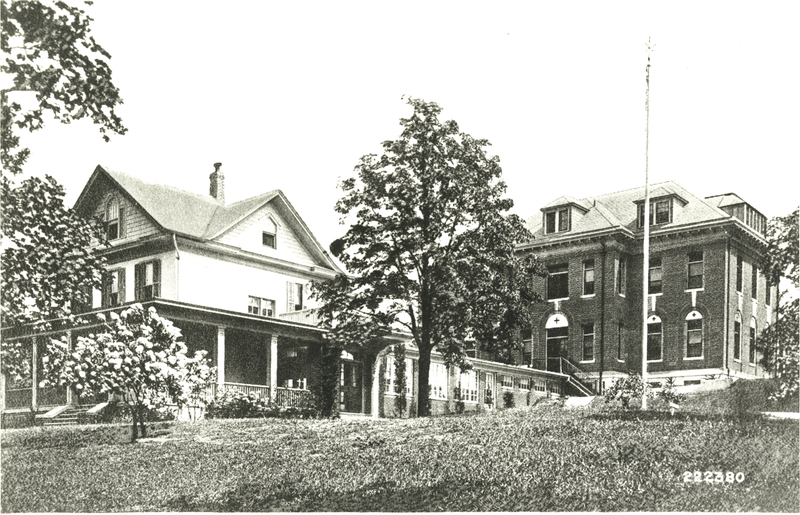 The first patient was admitted to the new hospital in February 1916. Miss Prime later led her friend, the Reverend Charles Cragg, to the top of her property on Park Avenue from where they could see the new hospital and said, “The desire of my heart is accomplished.” Miss Prime died in 1923 and is remembered as one of Huntington’s greatest philanthropists. The Long-Islander, May 29, 1914. The Brooklyn Daily Eagle, October 26, 1914. The Brooklyn Daily Eagle, October 6 and 17, 1914. The Trained Nurse and Hospital Review, January 1917 (Lakeside Publishing Co., NY), page 312. I enjoyed the Huntington Hospital history. Thanks!